Julie Dawkins Family: Around the house fun! Sometimes I just need a little prompting for games to entertain my little one. My sister and I were talking today about planning a few activities everyday so I researched a few. Hopefully this will help your "planning" too. 1. Bowling with plastic bottles. Line a few 2 liter pop bottles on the floor and let them practice rolling a ball. 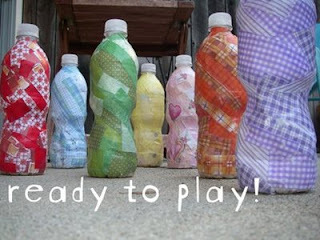 Click on this link for how Eli's Lids decorated her bottles. Way cute! 2. 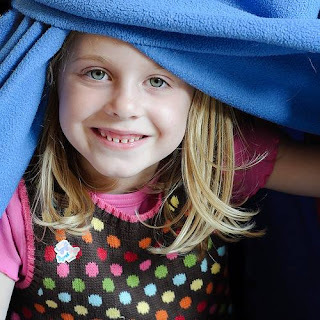 Make a Nest: Here's a cosy activity for toddlers. Grab a load of bedding, and take it into your living room. Pop it all down in a corner or down by the sofa. Let your toddler crawl about under the bedclothes and roll around - and don't forget to add a few soft toys or a favorite book. This can be quite boisterous, if your tot decides to leap around and then dive into their nest! But it can also be quite nice and calming for them. 3. Grab a box and go around the house and collect a random collection of things that are safe for your child and that you don't mind her/him playing with; set it next to your child and let them have at it! 4. Set up an obstacle course and crawl through it. A couple of dinning chairs and a blanket will get you started.